Wall Street rallies, then retreats as investors digest new details on the bank plan from Treasury. Despite a deluge of bleak economic news, these nine people are staying optimistic and finding success. NEW YORK (CNNMoney.com) -- Wall Street abandoned a late-session rally attempt Wednesday, ending lower, as investors took a mixed response to new details on Treasury's plan to help stabilize the banking system. On Thursday, investors will focus on Obama's fiscal 2010 budget plan, the weekly jobless claims and reports on new home sales and durable goods orders. The Dow Jones industrial average (INDU) lost 80 points, or 1.1%. The S&P 500 (SPX) index fell 8 points, or 1.1%. The Nasdaq composite (COMP) lost 16 points, or 1.1%. 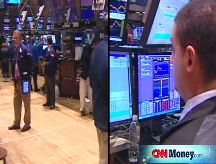 Stocks tumbled in the morning after a report showed existing home sales plunged to an 11-year low in January. But equities managed to cut losses and even turn higher in the afternoon after the bank plan announcement, with a number of financial stocks rallying. "I think people are just glad to know what they are planning," said Dave Rovelli, managing director of U.S. equity trading at Canaccord Adams. Yet after a brief rally, stocks erased the gains and turned lower again, as investors continued to worry about the depth and duration of the recession. "There's a lot of nervousness," said Terry L. Morris, senior equity manager at National Penn Investors Trust. "It's a tug-of-war between the news that's out there and the fact that the market has already gotten pounded." Confusion about the bank bailout plan has dragged on stocks lately. And recent worries have surrounded the threat of nationalization, which would wipe out shareholder value. On Tuesday, Federal Reserve Chairman Ben Bernanke downplayed bank takeover talk, helping the stock market bounce off 12-year lows. The Treasury announcement Wednesday added to bets that the government doesn't plan to nationalize, Rovelli said. "They're probably going to handle things like they are with Citigroup, where they take a stake in the bank, but don't take it over," he said. The collapse of the housing market has left banks riddled with bad debt that they can't unload, and that makes them wary of lending to businesses and individuals. Although the credit markets have shown a slight improvement lately, the lending market is still sluggish at best, exacerbating the impact of the recession. Treasury's bailout plan is ideally meant to keep banks afloat, but also get them to lend again. The plan may achieve that, but it doesn't resolve the problem of how to value the bad assets at a price that is both good for the holders and good for the buyers, said Gregory Miller, chief economist at SunTrust Banks. "They're trying to repair bank balance sheets when the assets that define the balance sheets keep declining," he said. "This plan may come a step closer to doing that, but it's taking an indirect route, instead of attacking more directly." Shares of bank stocks were volatile after the Treasury news. Citigroup (C, Fortune 500) and Goldman Sachs (GS, Fortune 500) ended lower. Wells Fargo (WFC, Fortune 500), JPMorgan Chase (JPM, Fortune 500) and Bank of America (BAC, Fortune 500) ended higher. Washington: Speaking Tuesday night before both chambers of Congress, President Obama told the nation: "We will rebuild, we will recover and the United States of America will emerge stronger than before." The president outlined plans for creating jobs, stabilizing the credit markets, reforming health care and improving schools, among other issues. He presents his fiscal 2010 budget plan to Congress Thursday. Separately, President Obama told Congress Wednesday that stronger financial sector regulation is needed. Ben Bernanke told the House Financial Services Committee Wednesday that fixing the mortgage market is necessary for fixing the financial market, even if it means bailout out irresponsible buyers. Company news: Ford Motor (F, Fortune 500)'s CEO and chairman agreed to cut their pay by 30% for the next two years and to suspend bonuses for salaried workers. Ford will also offer another round of buyouts and early retirement packages to all of its hourly workers. The changes were announced as union members are nearing a vote on contract concessions. General Motors (GM, Fortune 500) rallied nearly 15%. Currently, an Obama administration task force is reviewing turnaround plans from GM and Chrysler, which have asked for a combined $22 billion more in bailout money on top of the $17.4 billion they have already received. 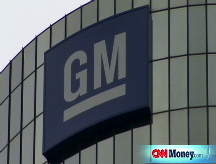 GM issues fourth-quarter results before the start of trading Thursday. In deal news, Canadian fertilizer Agrium made a hostile bid for U.S. rival CF Industries (CF) worth $3.6 billion in cash and stock - a 30% premium over CF's closing price Tuesday. Any deal is conditional on CF giving up its hostile offer for Terra Industries (TRA), which the company has already rejected. First Solar (FSLR) plunged 22% in unusually active Nasdaq trade after the solar panel maker warned late Tuesday that first quarter and full-year 2009 revenue will fall from a year ago amid a bleak outlook for the industry and economy. Market breadth was negative. On the New York Stock Exchange, decliners beat advancers three to two on volume of 1.82 billion shares. On the Nasdaq, losers beat winners by more than two to one on volume of 2.45 billion shares. Bonds: Treasury prices tumbled, raising the yield on the benchmark 10-year note to 2.92% from 2.79% Tuesday. Treasury prices and yields move in opposite directions. Other markets: In global trading, Asian markets rose and European markets were mixed. U.S. light crude oil for April delivery rose $2.54 to settle at $42.50 a barrel on the New York Mercantile Exchange. The price of oil was volatile after the government said the supply of crude increased less than expected last week. COMEX gold for April delivery fell $3.30 to settle at $966.20 an ounce.